Up until recently I’ve been a bit reluctant to adopt emoji characters in my everyday communication. But ever since they’ve been elevated to greater prominence on phones and on services such as Slack, I’ve given in completely. If I had the creative energy and patience, I’d write this whole post with emoji (though it mightn’t make it past Liz’s editorial discretion)! 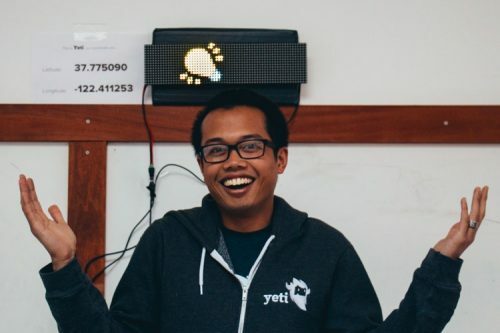 Each hilarious excuse has its own emoji character, and Dean wanted the office’s Raspberry Pi-driven LED matrix ticker to show which emojis were being used by the users of the app. 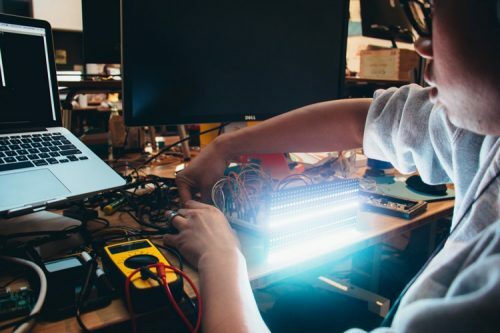 After some turbulence with wiring up the hardware and some clever web implementation, he was lighting up the office with   and , using a blend of Python for the network requests and C for driving the LED matrix. That is neat! So could they do ? in the middle of an extremely boring meeting? ? No, better than that! Depending on what they’ve chosen in the app they’d maybe get a call, and then a series of texts, and then perhaps yet another call, to the effect it’s essential they leave the meeting immediately to attend to a flooded basement/seriously ill family member/gravely misbehaving school-age child/etc. Including the biggest Raspberry Pi we've seen!